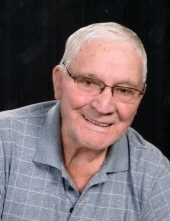 Donald Blaine Sutton, 87, Phillips, Town of Worcester, passed away peacefully with his family at his side, at the Marshfield Hospital in Marshfield on Thursday, March 28, 2019. Don was born in Fifield, Wisconsin, on October 5, 1931, to Rodney and Ruby (Adams) Sutton. He grew up in Phillips, and was a 1948 graduate of the Phillips High School. After high school, he worked for Lake Superior Power Company and the Peterson Lumber Company. On December 30, 1950 Don married his high school sweetheart, Ruth Chase. Their 68 year marriage resulted in 8 children, 18 grandchildren, 16 great grandchildren, and many happy memories. Throughout his life, many recognized Don as their milk hauler, logger, grader and snowplow operator. His longest achievement, which touched thousands of lives over the years, was his role for 35 years as school bus driver for the Central School District. Those who knew Don would tell you that he typically had a smile on his face and nobody was safe from his good hearted bantering. Everyone holds many fond memories of him. Don is survived by his wife, Ruth; by seven children, Jeanie (Jim) Heizler, Phillips, Roger (Annie), Crivitz, WI, Jerry (Diane), New Berlin, Donna (Tom) Kovarik, Butternut, Jesse (Colleen), Phillips, Virginia “Ginger” (Mark) Amelunk, West Allis, and Scott (Monique), River Falls, WI; by 17 grandchildren, Lance (Kim), Jerry (Dana), Donald (Liz), Lori, Lynn, Ricky, Michelle (Jason), Jonah (Frances), Daniel, Mindy, Bo, Jillian (Derek), Savannah, Julia (Chad), Treigh, Kevin, and Kimberly; by 16 great grandchildren, Delton, Storm, Brittany, Hunter, Isaiah , Noah, Aubrey, Landon, Fawn, Nova, Matilda, Brea, Jackson, Maddi, Colin, and Makenin. He is further survived by nieces, nephews, and other relatives and many friends. He is preceded in death by his parents, by his infant son, David; by grandson Noah; and siblings Lenore, Laura Mae, Archie, Dale, and Ken. The family suggests that memorials take the form of an offering to the Saint John Lutheran Church Kitchen Fund in Don’s memory. To plant a tree in memory of Donald Blaine Sutton, please visit our Tribute Store. "Email Address" would like to share the life celebration of Donald Blaine Sutton. Click on the "link" to go to share a favorite memory or leave a condolence message for the family.